Whether it is ghosts, aliens, or other creepy themed ideas you want for Halloween party games, Megableu is the right place for you! At Megableu you can find the perfect Halloween activities to spend the scariest of holidays. Our collection includes the Ghost Hunt Evolution, the Alien Mission, and the Creepy Hand. Treat yourself with the best Halloween toys and games for kids. Beware! Halloween is a ghosts’ favourite time of the year! 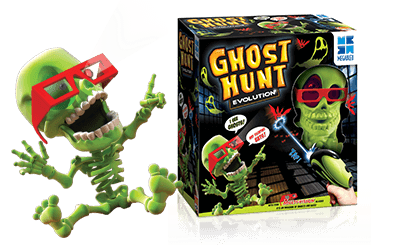 Ghost Hunt Evolution is a fun and energetic game that is played only in the dark! Go alone if you dare or get your friends with you in a wild ghost chase. Billy Bones is on the lookout for ghostly activity. He spots ghosts and bats flying around in the room! With your MULTI-VISION glasses and your zapper gun you can eliminate them all! Who will score the most points by hitting them? 1 or more players can join in this Halloween game for kids! Suitable for children over 5 years old. If you are dressing up as an alien-eliminator, this is your chance to shine! 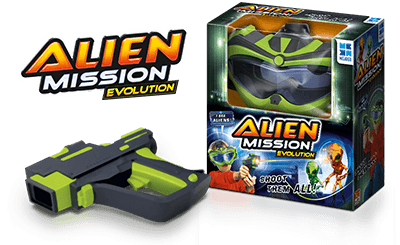 Alien Mission Evolution puts you into the space-battle with Aliens. Take at least one friend to help you save the world from Aliens. Your gear is ready: a special anti-alien gun and your goggles. The goggles help you and your friends to spot the Aliens. Be quick to aim and shoot the most to alienate your friends! From 5 years. 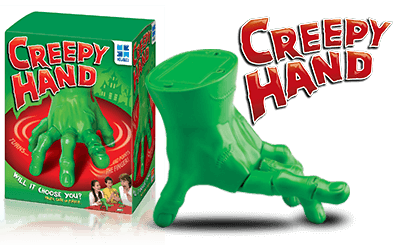 Can you survive the Creepy Hand? We saved the creepiest for last. Get ready because you might be next with the Creepy Hand! 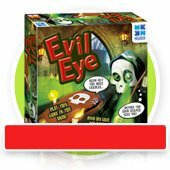 This thrilling game is perfect for Halloween party gatherings as it requires 2 or more players of at least 7 years of age. If you love ‘Truth or Dare’ then you will definitely enjoy the Creepy Hand. The actual-sized Hand moves around the table to stop and point at one of the players. The player has then to get a card and choose whether to complete a truth or dare question. If you fail the task, you’ll have to undertake an extra challenge that the card mentions. Is the Creepy Hand going to point at you next? Megableu doesn’t play tricks, it just offers treats!